In The New Scarlett Letter, Steven Raphael points to a very significant and growing problem in the United States: the countrys dramatic prison boom over the past three or four decades means that vast and increasing numbers of largely unemployable people are released from prison every year. The numbers he provides to illustrate the magnitude of the problem are startling. Close to 700,000 prisoners were released in 2011, for instance, and roughly 2.3 million more were in prisons and jails at the time, the vast majority of whom have since been or soon will be released and then replaced. Raphael cites a Bureau of Justice Statistics study reporting that 2.6 percent of all adult white males, 7.7 percent of Hispanic adult males, and 16.6 percent of African American adult males had state and/or federal prison records in 2001. In addition, the study predicts that if current trends continue, 5.9 percent of the white males born in 2001 will go to prison during their lifetimes, along with 17.7 percent of Hispanic and 32.2 percent of African American males born that year. Furthermore, drawing from a study using data from 2008 to 2011, Raphael compares the U.S. incarceration rate of 743 people in prisons and jails per 100,000 in population to the rate of 113 per 100,000 for Canada, 200 for Mexico, from 59 in Finland to 159 in Spain for the fifteen original European Union countries, and the median rate of 113 across all countries. The U.S. prison population averaged about 110 per 100,000 between 1925 and 1975 before it began rising, reaching 500 in 2006. The possibilities for these released prisoners to successfully obtain employment are depressingly low. Laws prohibiting employment of criminals are applicable to many jobs, but, more importantly, employers can be held liable through tort law for their employees actions, so hiring people with criminal records raises their insurance costs if they can even get insurance (insurance companies often classify employees with criminal records as nonbondable). Add the general concerns about employee theft and other crimes committed against the employer and customers, and it is not surprising that a substantial majority of employers will not consider employing someone with a criminal record. Many of the people who end up in prison already have limited employment opportunities even before they are convicted, however. Although Raphael does not present statistical tests of significance and magnitudes of the impact of various factors on either criminal behavior or employability, the means and medians of numerous characteristics of current and former prisoners that are individuals, although it is a relatively significant one. Raphael presents findings from several surveys indicating that employers are more likely to hire someone with little work experience or who has been unemployed for a substantial period than they are to hire someone with a criminal record (pp. 4446). The explosion in imprisonment since the mid-1970s may appear to suggest that the United States has become a very dangerous place. In fact, however, property and violent crime rates have generally been falling. Moreover, the growing prison population is not due to increased arrests for these crimes. Part of the growth in prison populations (and in released prisoners) reflects substantial increases in the portion of those arrested who are sentenced to prison as well as to longer sentences for most core crimes. Much of the growth, however, is due to dramatic increases in incarceration of drug law offenders (from 9 per 100,000 in 1984 to 47 per 100,000 in 2009), parole violators (15 per 100,000 in 1984 to 46 per 100,000 in 2009), and other criminals (13 per 100,000 to about 33 per 100,000 over the same period). Raphael explains that the increasing use of prison to punish core criminals and drug offenders reflects the fact that over the last three decades, sentencing policy has become highly politicized (p. 23). He suggests that although judges used to determine sentences and parole boards used to determine time served, both have been significantly constrained through legislationmandating minimummandatory sentences, sentence enhancements for repeat offenders (e.g., three strikes), and truth in sentencing laws requiring that a minimum portion of sentences be served (often 85 percent). Although this legislation is clearly a major part of the explanation, it actually is just one component of a larger overcriminalization problem, other aspects of which Raphael does not consider. In this context, the American Legislative Exchange Council reports that [t]here are so many criminalized actions that no one has been able to determine a definitive count (Criminalizing America: How Big Government Makes Criminals of Every American, in The State Factor [Washington, D.C.: American Legislative Exchange Council, 2013], 2). Even if the effort to count criminal laws is limited to the federal level, Paul J. Larkin Jr. suggests that there are so many federal criminal laws that no one, including the Justice Department, the principal federal law enforcement agency, knows the actual number (Public Choice Theory and Overcriminalization, Harvard Journal of Law and Public Policy 36 : 726). John H. Baker estimates that there were about 4,450 federal crimes in 2008 and around 300,000 regulatory violations with criminal penalties (Revisiting the Explosive Growth of Federal Crimes, Heritage Foundation LegalMemo no. 26 [Washington, D.C.: Heritage Foundation, June 16, 2008], 5). 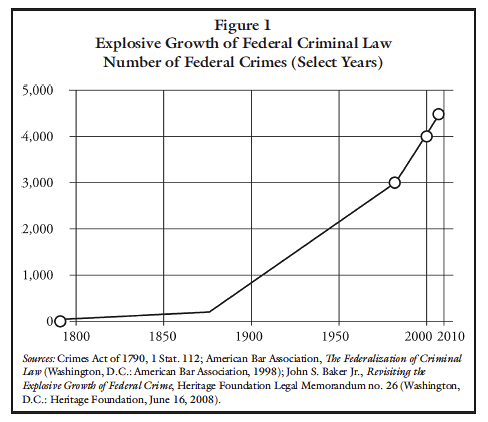 Although the number of federal criminal laws has been expanding since the country was established, the rate of this expansion has been very rapid since the 1980s, as illustrated in figure 1. The growth in the other crimes category reported by Raphael is likely to be explained by the increasing number of legislated and regulatory crimes (this number also explains some of the growth in drug criminals being imprisoned as legislation has criminalized possession of more drugs, inputs to drug production, drug paraphernalia, etc.). This expanded view of the source of growing imprisonment suggests two addenda to Raphaels story. One is that the politicization of penal law is relatively more complex than he suggests. Overcriminalization means that it is impossible for police and prosecutors to effectively pursue all crimes and that they have tremendous discretion regarding what laws they are going to enforce, who to arrest, who to charge with what, and how to achieve a sentence. As a result, the criminal law as actually applied is determined by police and prosecutors, not by legislators. Furthermore, the role of judges is reduced even more than Raphael suggests: [P]rosecutorial discretion is ubiquitous throughout the criminal system, and largely dominates its outcomes, comments Jeffrey S. Parker. [P]rosecutors decide who to investigate, how to investigate, who to charge, what to charge, how many redundant charges to present, what evidence to present, how that evidence is presented, who is not charged, who is immunized (and therefore probably a prosecution witness), who is implicated but not immunized (and therefore denied as a defense witness), what to take up under the asymmetrical criminal appeals statute, whether to plea bargain, how to plea bargain, what is in the plea bargain, and so on, ad infinitumand all largely beyond any judicial scrutiny whatsoever (Developing Consensus Solutions to Overcriminalization Problems: The Way Ahead, Journal of Law, Economics, and Policy 7 : 73536). Prosecutors can threaten longer sentences to induce plea bargains, as Raphael suggests, but they also can threaten conviction of multiple counts, each with its own sentence, for what actually is a single act. The second implication of the expanded view of politicized penal law involves potential solutions to the problem identified by Raphael. He explains that there are hundreds of reentry programs around the country and hundreds of evaluation studies for such programs. He concludes that there is some evidence of success from programs offering transitional employment opportunities and human capital development, but less evidence if effective programs offer income support. He finds stronger support for programs for at-risk youth before they turn to or are convicted of criminal activities and for in-prison occupational training, drug treatment, and behavioraladjustment programs. He reminds us, however, that the reentry problem is growing because of political decisions to incarcerate more people for crimes they commit and to do so for longer periods of time, not because of increasing amounts of misbehavior. Therefore, Raphael correctly concludes that we could substantially scale back our use of incarceration and maintain current, historically low crime rates. . . . [S]entencing philosophy needs to shift in the direction of reserving involuntary confinement for those who pose the greatest risk and alternative sanctions for those who do not (p. 83). When other aspects of overcriminalization are considered, however, a broader policy change is suggested: decriminalization of a wide variety of offenses. Government is trying to control too much behavior. Furthermore, many harmful actions that are now crimes have been and still can be dealt with through tort law resulting in compensation for victims (see Bruce L. Benson, Lets Focus on Victim Justice, Not Criminal Justice, The Independent Review 19, no. 2 [Fall 2014]: 20938).